TGIF! and I start the weekend with homemade peruvian eggnog! 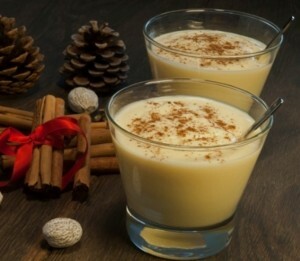 Eggnog is a traditional Christmas drink (you can have it with alcohol or without) and the entire family can enjoy together. In Peru we call it “Rompope” (Rum-po-pay) and according to my mom’s tale, my grandma would make it for all the kid’s birthdays and every holiday. All the kids would wake up to the noise of 2 forks beating the eggs early in the morning when my grandma started the celebrations making this delicious and creamy drink. Forget about whisks or kitchenAid mixers! She would do it the old school way with 2 forks against a metal bowl. Love it!!! I now have it so much easier but the recipe is the same. And I, just like my mom and grandma always look for reasons to celebrate with our loved ones. Here is my recipe that I guarantee you you will love, love, love! Blend the eggs for about 3 to 4 minutes until they are very creamy, add condensed milk, peach halves and vanilla extract and mix very well. Add rum slowly so the alcohol blends with rest of mixture. Blend some more. Serve in glasses and add cinnamon powder and/or a cinnamon stick to use as a stirrer. Cheers!